32nm – Carpet Bomberz Inc. I would like to applaud Apples 32nm migration plan. By starting with lower volume products and even then, only on a portion of the iPad 2s available on the market, Apple maintains a low profile and gets great experience with Samsungs 32nm HK+MG process. via AnandTech – The iPad 2,4 Review: 32nm Brings Better Battery Life. Anand Lal Shimpi @ Anandtech.com does a great turn explaining some of the Electrical Engineering minutiae entailed by Apple’s un-publicized switch to a smaller design rule for some of it’s 2nd Generation iPads. Specifically this iPad’s firmware reads as the iPad 2,4 version indicating a 32nm version of the Apple A5 chip. And boy howdy, is there a difference between 45nm A5 vs. 32nm A5 on the iPad 2. Anand first explains the process technology involved in making the new chip (metal gate electrodes and High dielectric constant gate oxides). Most of it is chosen to keep electricity from leaking between the two sides of the transistor “switch” that populate the circuits on the processor. The metal gates can handle a higher voltage which is needed to overcome the high dielectric constant of the gate oxide (it is more resistant to conducting electricity, so it needs more voltage ‘oomph!’ applied it). Great explanation I think regarding those two on-die changes with the new Samsung 32nm design ruling. Both of the changes help keep the electrical current from leaking all over the processor. What does this change mean? Well the follow-up to that question is the benchmarks that Anand runs in the rest of the article checking battery life at each step of the way. Informally it appears the iPad2,4 will have roughly 1 extra hour of battery life as compared to the original iPad2,1 using the larger 45nm A5 chip. Performance of the graphics and cpu are exactly the SAME as the first generation A5. So as the article title indicates this change was just a straightforward die shrink from 45nm to 32nm and no doubt is helping validate the A5 architecture on the new production line process technology. 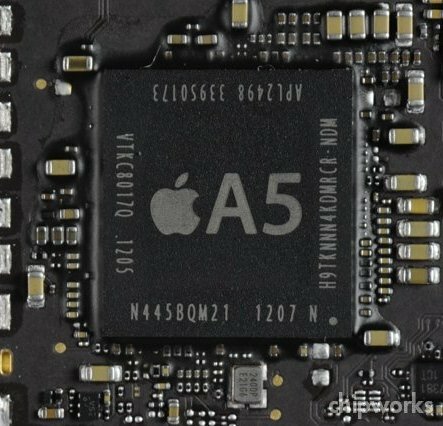 And this will absolutely be required to wedge the very large current generation A5x cpu on the iPad 3 into a new iPhone in the Fall 2012. But consider this, even as Apple and Samsung both refine and innovate on the ARM architecture for mobile devices, Intel is still the technology leader (bar none). Intel has got 22nm production lines up and running and is releasing Ivy Bridge CPUs with that design rule this Summer 2012. While Intel doesn’t literally compete in the mobile chip industry (there have been attempts in the past), it at least can tout being the most dense, power efficient chip in the categories it dominates. I cannot help but wonder what kind of gains could be made if an innovator like Apple had access to an ARM chip foundry with all of Intel’s process engineering and optimization. What would an A5X chip look like at the 22nm design ruling with all the power efficiency and silicon process technologies applied to it? How large would the die be? What kind of battery life would you see if you die-shrunk an A5X all the way down to 22nm? That to me is the Andy Grove 10X improvement I would like to see. Could we get 11-12 continuous hours of battery life on a cell phone? Could we see a cell phone with more cpu/graphics capability than current generation Xbox and Playstations? Hard to tell, I know, but thinking about it is just so darned much fun I cannot help but think about it. 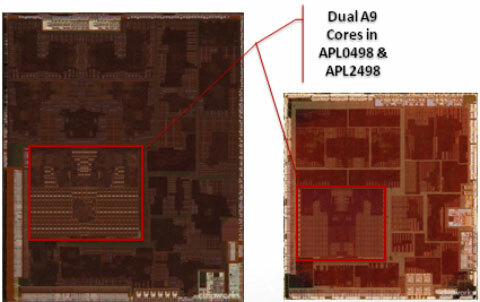 Design rules at 45nm (left) and 32nm (right) indicate the scale being discussed in the Anandtech article.